It isn’t easy to be a phage. First, what is a phage? A phage is a virus that infects Bacteria. To succeed, a phage must encounter, recognize, and enter a particular type of bacterial cell, then coerce it to make more phages rather than more cells. Of course, the cell resists this hostile takeover in numerous ways, all of which the successful phage overcomes. The triumphant phage then proceeds with its replicative business. 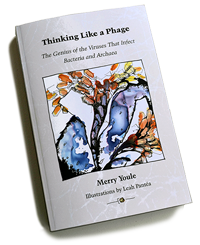 In this engaging book, Merry Youle relates some of the tactics used by 21 pheatured phages to outwit their host and successfully maintain their own lineage generation after generation. This ongoing contest of wits is a matter of life and death for both players. A phage chromosome arriving in its intended host cell is met by the cell’s state-of-the-art defenses. If the phage survives, it then quickly diverts the cell’s machinery to production of more phages. As the new phage components are produced, some self-assemble into sophisticated transport packages capable of delivering a phage chromosome into a new host cell. When the new crop of progeny is ready – perhaps 25, 100, or more of them – the phage ruptures the cell to free them all and send them out into the world in quest of hosts of their own. Overall, a balance is maintained so that both the phages and their hosts thrive. Many phages have the option to instead follow a different script. When they arrive in a host, they can choose to form an ongoing coalition with the host for mutual benefit. This alliance can continue for many generations. However, if the cell encounters life-threatening difficulties, the phage switches to rapid replication. Before long, it breaks open its former partner to release of the new generation. Each step of the way presents challenges that test the ingenuity of the phages. In this book, tales of phage prowess are accompanied by pertinent electron micrographs; every chapter is enlivened by informative illustrations created by San Diego fine artist Leah Pantéa. The writing focuses on strategies and underlying principles, with a minimum of jargon. Since some knowledge of molecular biology is required to appreciate phage wizardry, a primer of the needed basics is provided for those unfamiliar with that subject. Thus, these phage adventures can be enjoyed by a wide audience. Despite being the most abundant life form, the phages – being much smaller than even the microbes they infect – elude our everyday perception. Thinking Like a Phage offers a tour of this unseen dimension of life on Earth. Awareness of this vast, creative, yet invisible realm can enrich your appreciation for the living world of which we, as Homo sapiens, are only a small part.